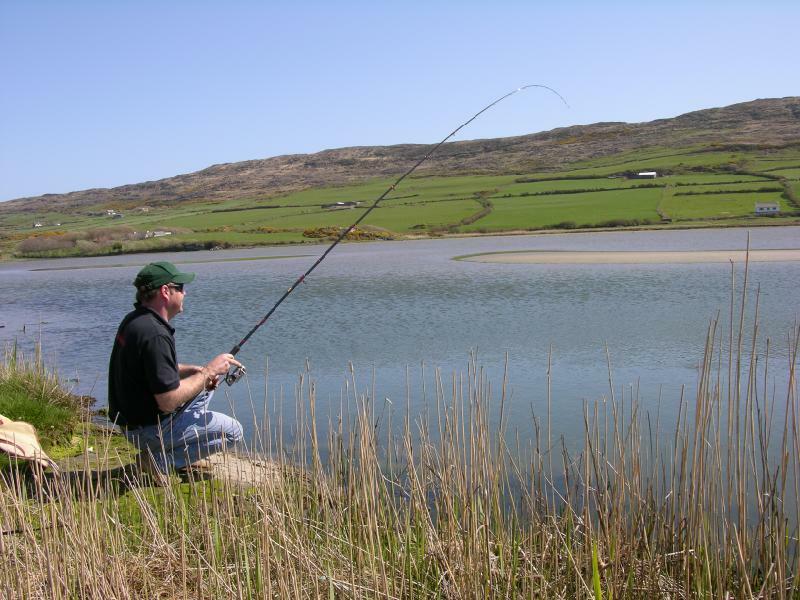 When it comes to shore angling, it seems I just cannot get enough of the Kerry coastline. Even though anglers have been coming here for years, it is a safe statement that much of this shoreline has yet to see a fishing rod. It is this virgin territory with its stunning scenery and promise of spectacular catches that attract me to drive the three hundred and fifty miles journey as regular as my schedule and wallet will allow. On my latest trip to Waterville, I arrived to find clear skies, scorching hot sunshine and flat seas, and headed straight to Kevin Brain’s house where I had booked a couple of nights accommodation. My plan, as usual, was to seek out some Bass fishing in the area and maybe find some Pollack to tackle on the fly rod, however, as I soon discovered, this wasn’t Kevin’s plan. 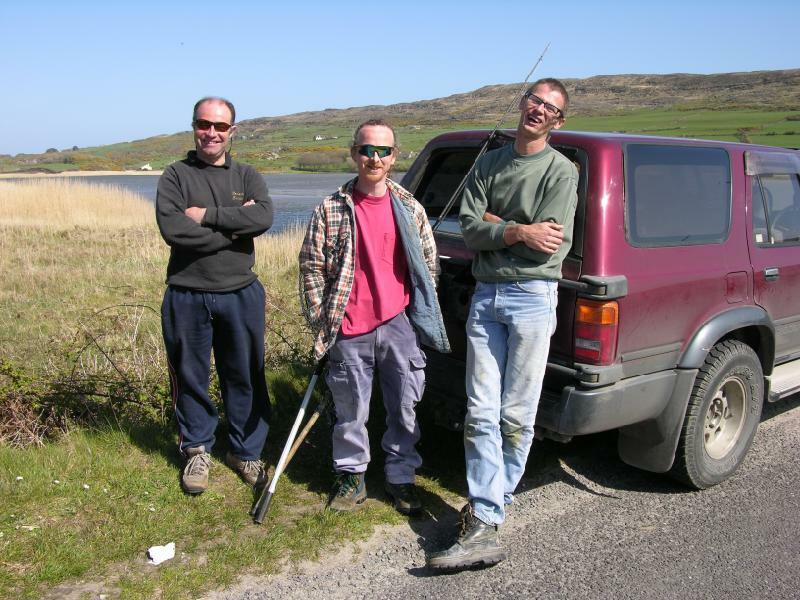 As a bit of a surprise, he had organised a Mullet trip down in Bantry, and arranged to meet two local Mullet experts who could, apparently, almost guarantee a successful day. Kevin, Trevor and Simon, my Mullet guides for the day. I was delighted to have a go at something completely different from the norm, but as this was totally unexpected, I had not brought any light tackle with me. This was such a pity really, as my coarse angling gear back home would suit perfectly. 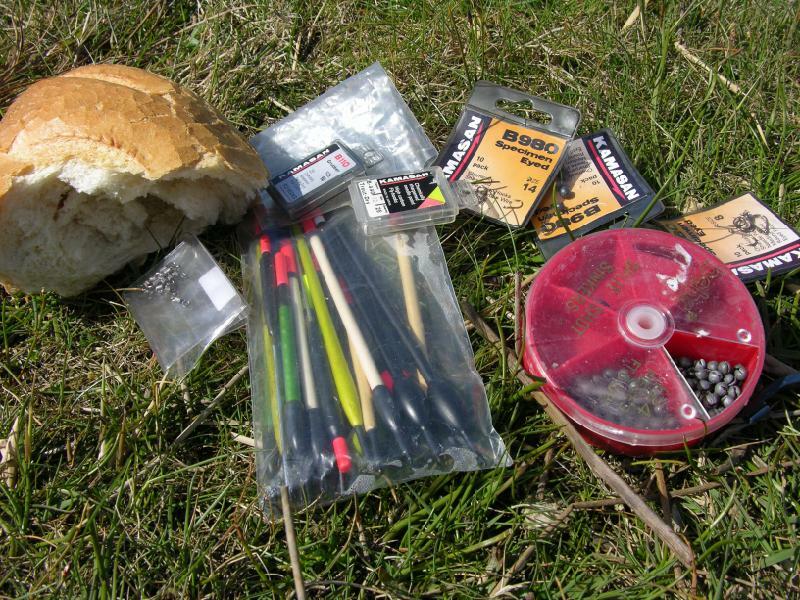 Kevin had a hunt through his garage and found a quiver tip rod and reel I could borrow, which would suffice as a makeshift float rod, and I had an eight weight fly rod with me, just in case I found time for a cast on Lough Currane, so between us, we were in business as they say. A quick telephone call and we were on our way to Bantry Bay. The hour and a half journey seemed to take forever, especially as the lads we were to meet had told us that already this morning, they had a shoal of Mullet taking small offerings of bread off the surface. When Mullet are prepared to feed in this manner, there is a very good chance of deceiving one with a baited hook; I could hardly wait. 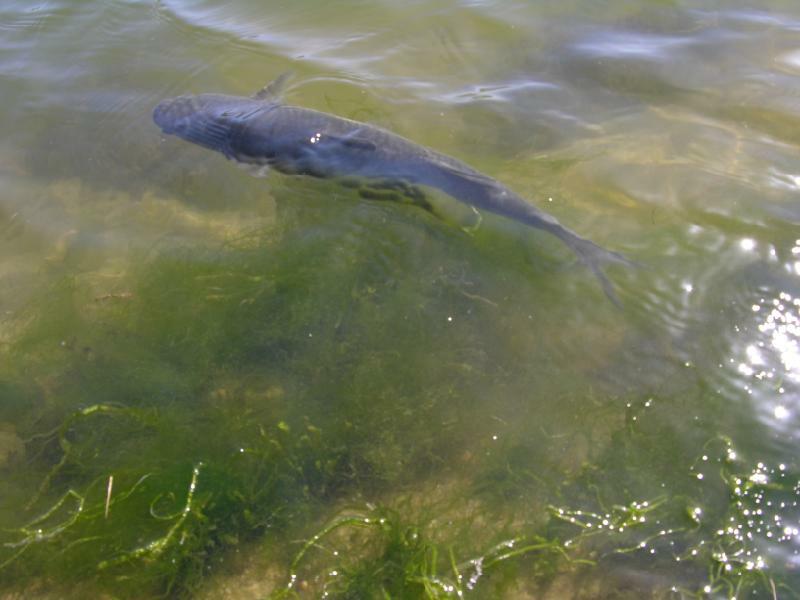 During the journey I recalled my two previous encounters with Grey Mullet, and both were accidental captures. The first was as a youngster when my father and I spun for Salmon on the Galway Weir, where I foul hooked a Mullet in the dorsal fin. It was only a small fish of three pounds but put up a memorable scrap on my light-spinning rod. The only other Mullet I have caught was many years later at Cushendun beach, on the Antrim coast whilst beach casting for Flounder. Using a bunch of “maddies” on a size one Aberdeen hook, I struck into an almighty bite and found myself playing a hard fighting fish. 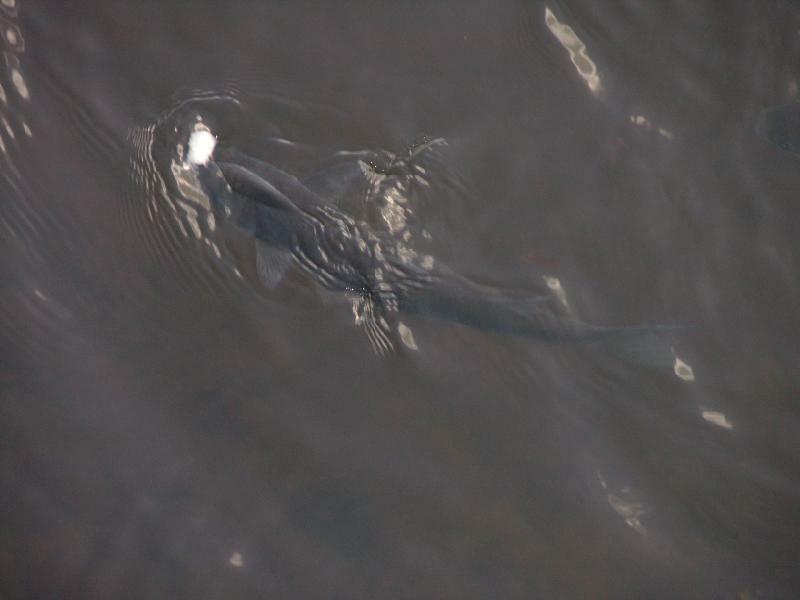 Glimpses of its silver flanks convinced me that a Bass had taken my Flounder bait, but I was pleasantly mistaken when I finally landed a fabulous Mullet of over five pounds. It just goes to show that you can never be sure which species may turn up whilst sea angling. On arrival at the harbour, the lads were waiting and busily keeping the shoal interested with free offerings, courtesy of Pat the Baker. One look at the fish and Kev grabbed his gear to get set up. I can honestly say that I have never seen an angler set up as quick in my life, and while I was still going through the introductions with Simon and Trev, Kevin had already dropped a baited hook in front of the bigger Mullet in the shoal. Although Trev was an accomplished angler, Simon was the Mullet addict, and during his travels around the British coast, has landed many fish just short of double figures. I listened to his Mullet stories with a mixture of interest and total envy at the thoughts of landing such huge specimens. With the introductions complete, I decided to set up the fly rod and attached six feet of six pounds breaking strain fluorocarbon as a tippet and, as necessity is the mother of invention, tied on a size ten buzzer hook! It was all I had with me, but, as it turned out, ideally suited to a small piece of bread flake pinched onto the shank, just enough to withstand a couple of false casts to reach the feeding fish. The Mullet took every piece of floating flake available but typically avoided mine and Kev’s bait the whole time. Just as I thought things were not going to happen, a Mullet rose from the depths and gently sipped in my buzzer hook and fish on! My memories of previous Mullet battles were justified as the fish took off against the clutch with tremendous power. 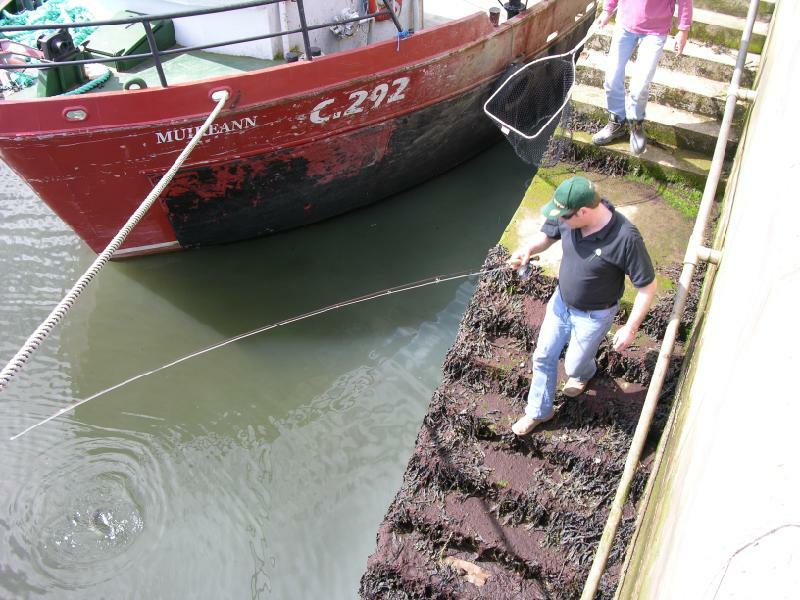 I soon realised that the top of a pier was not the best spot to land a fish. Reaching the rod around boat mooring ropes, I made my way down the stone steps to the waters edge while Simon followed with the knotless landing net, an important accessory as these fish are easily damaged. Mullet are great fighters on light, balanced tackle, we all know this, but what I had not realised is just how dogged they can be. They simply refuse to give up, and it became almost comical after the fish literally jumped out of the landing net for the third time. Eventually, with a sigh of relief, Simon managed to safely net the fish for a camera shot. 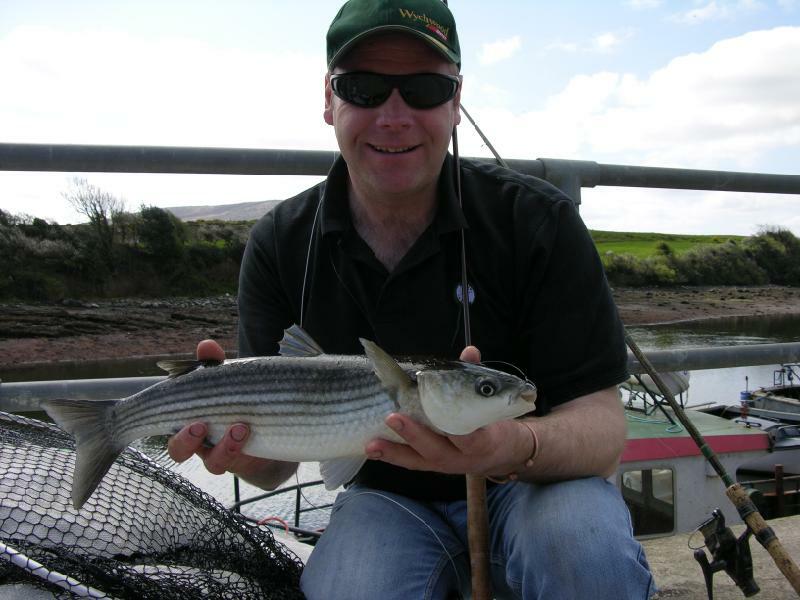 At only three pounds in weight, it had put up a tremendous account of itself, little wonder our Grey Mullet are known as the bonefish of Ireland. The commotion of the battle, and the addition of a couple of hungry swans, forced the shoal out of range. We hung around for a while, but with no sign of the fish coming back, Simon suggested a move to a new venue thirty minutes up the road. 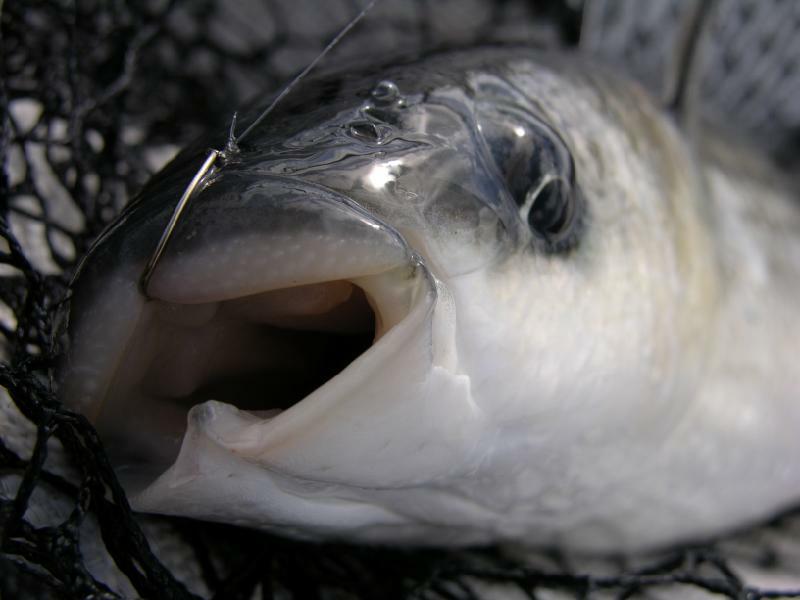 With harbours and estuaries in abundance, the mullet angler is simply spoiled for choice around these parts. Our second venue was idyllic, and one of Simon and Trev’s favourite Mullet hot spots. This is an in-land, salt water, tidal lagoon with a deep channel that gives Grey Mullet added protection and security. 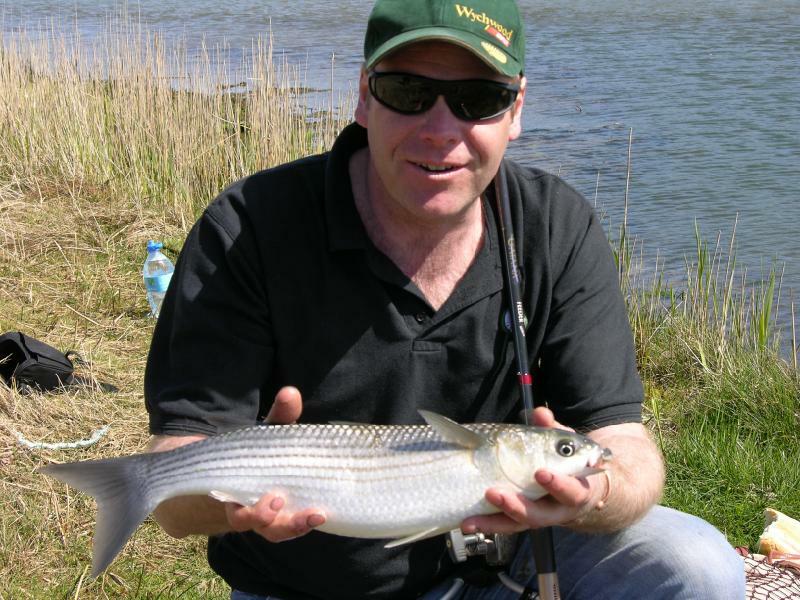 On a neap tide, there is no real depth of water in the lagoon, which forces the shoals to stay bottle-necked in the relatively small area of the channel, ideal angling conditions that have given Simon excellent sport, landing up to nine fish in a session. Unfortunately we were here on spring tides, that allowed the shoals to disperse out over the mud flats, but it was still worth an attempt for the remaining couple of hours we had to spare. Simon showed me an area in the shallows where Mullet had been feeding. The muddy bottom had several tracks and gouges marked here and there. According to Simon, these were mouth marks, left by the Mullet as they sieved through the mud looking for minute food particles. Apparently, an experienced Mullet hunter can gauge the size of fish in the area by examining the width of these marks. I began to feel like I was in the presence of Crocodile Dundee! As a reasonable breeze had picked up, I opted on this occasion for the quiver tip rod, and attached a small, crystal waggler to aid casting and counteract the surface drift. With the depth set to eight feet, and split shot bulked ten inches from the hook, I could fish the bread flake just above the channel bed, a method that my expert guides had recommended. This really is an exciting way of angling, watching for signs of a shoal passing through and almost stalking the fish using reeds as bank side cover and camouflage. Using wet, mashed bread as ground bait, we persisted to no avail, but a Mullet alerted us to its presence when it took a small piece of crust on the surface in the middle of the channel. This required a slight change in tactics, so I moved all the split shot up and around the float and also reduced the depth to four feet. The breeze was able to carry some bread offerings across the channel, along with my float. With each piece of bread systematically sucked from the surface, I held my breath, as all eyes were trained on the bread flake pinched around the hook. Down it went and I lifted into another powerful Mullet, and similar to the previous fish, it simply refused to come to the net. The light tackle required to deceive these species allows them to show just how powerful they can be, and it was a relief to see Kevin finally slip the landing net under the scale perfect, silver torpedo some five minutes later. This fish weighed slightly larger at three and a half pounds, and after a quick photo shoot it was soon returned, no worse off for the ordeal. I would like to take this opportunity to thank Kevin, Simon and Trevor for their help on my un-planned Mullet adventure. Their knowledge of the area and the species made the trip not only successful but also extremely enjoyable. If I learnt one thing from the trip, it was that the myth of Mullet being almost impossible to catch is nonsense. With patience, they will eventually begin to feed on a steady stream of offerings. Once this occurs, a hook-up is on the cards. 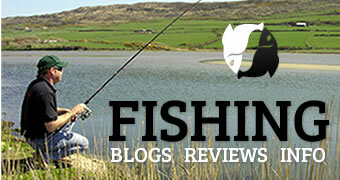 As you hold your breath waiting to strike, be prepared for a tough and lengthy battle from these superb sporting fish. The well-known myth that Mullet are soft mouthed is a fallacy. There mouths are tough, so, although a relatively small hook is advised, make sure it is a strong wire design and extremely sharp. Keep the free offerings going in, on a little but often basis. Once the Mullet are confident to take the offerings, a hook up should follow. 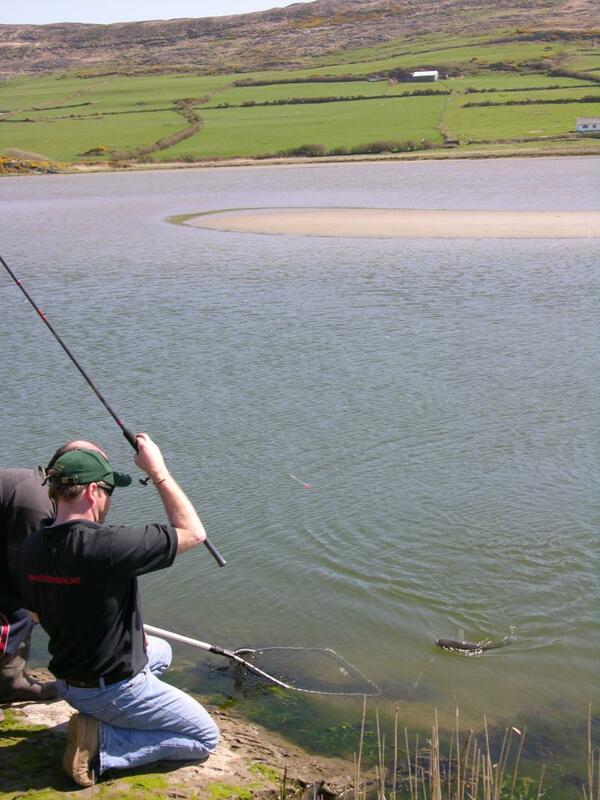 Use a knotless mesh landing net. Mullet scales are easily dislodged. Careful handling will avoid un-necessary damage. 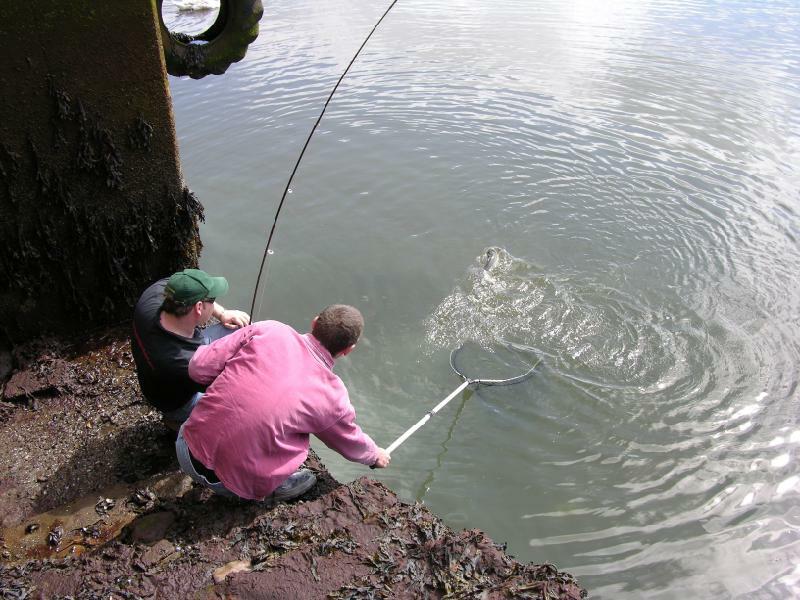 When releasing a fish, allow plenty of time for it to recuperate. This is simply achieved by gently supporting the fish, facing upstream or up-tide until it is fully recovered.